The Office of Housing and Food Services decided to re-open the Pritchett Snack Bar -- probably by next fall -- after doing some renovations, said President of East Campus Tariq M. Shaukat '94. The East Campus house manager made the announcement at an East Campus house committee meeting Wednesday night, Shaukat said. Until Pritchett is reopened, there will be a short term solution. Shaukat said he will not know the details until a meeting with housing and food services administrators next week. The shortage of late night dining options on the east side of campus stems from cutbacks by housing and food services this semester. Because of financial reasons, dining hours at Morss Hall were shortened to 5 to 7 p.m. on weekdays. The Pritchett Snack Bar was closed completely. In response to the closing of Pritchett, East Campus and Senior House students submitted a proposal to food services Nov. 23. This dining proposal recommended reopening Pritchett spring term and offering late night hours on weekdays and extended hours on weekends. The proposal, based on surveys as well as student input at meetings, also suggested that students staff the snack bar, and be provided with training to improve quality and efficiency. 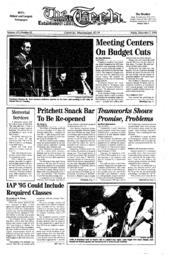 Reopening Pritchett Snack Bar will require renovations of an aging dining area. "The overall facility is old and has not been fully renovated in years," said John T. McNeill, associate director of food services, before the decision to reopen Pritchett was made. Sanitation and health-related aspects of Pritchett need to be addressed, he said. Security issues must also be resolved before Pritchett can be reopened. According to McNeill, the doors to Pritchett cannot simply be closed after hours in order to secure supplies and equipment because it would be a fire hazard. Other costly means would have to be employed, he said. Until Pritchett is renovated, extending Morss Hall's hours could be a possible option for resolving the east side's dining problems. McNeill discussed this as an option before deciding to reopen Pritchett. Morss Hall was recently renovated, and these renovations include the added capability of Morss Hall to produce fast food comparable to the service Pritchett provided. In addition, students would have access to the Pizza Hut that is located in Morss Hall, McNeill said.